Gorgeous Hannah Bartoletta custom home in FishHawk Ranch! This executive home features 4 bedrooms, 3 baths, enormous bonus room & all the upgrades youâve been dreaming of! Sitting on an oversized conservation lot this home feels so private & offers breathtaking wooded views! Arriving at the home youâll immediately notice the lovely tile roof, exquisite elevation & pavered entryway! Formal living & dining rooms accent the foyer, perfect for entertaining! Dreamy kitchen boasts granite countertops, built in stainless appliances, large center island, & tons of beautiful cabinet space topped w/crown & detail molding! Inviting family room is open to the kitchen to maximize the living space & offers pocket sliding doors opening all the way out to the lanai, really bringing the outdoors in! Three-way split floorplan keeps the master suite secluded on one side of the home w/gorgeous engineered hardwood flooring & a spa-like en-suite w/his & hers vanities topped w/marble, garden tub & separate shower! All three secondary bedrooms are large in size & the fourth bedroom is tucked at the back of the house w/a bonus room & private bath. This is a wonderful mother-in-law suite or guest retreat! The oasis of the outdoors awaits you w/a sparkling swimming pool & spa, outdoor kitchen, pavered lanai & the most stunning conservation views! 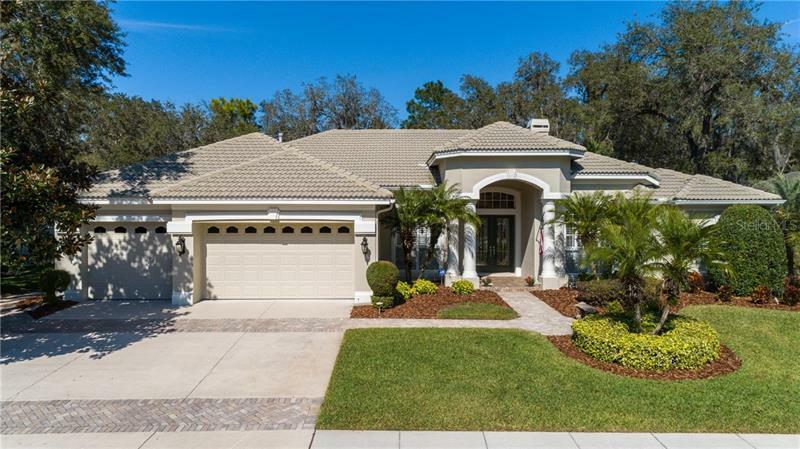 Located in the gated community of Eagle Ridge within FishHawk Ranch & is zoned for some of the best schools in Hillsborough County! Come take a look for yourself, this one is a winner!